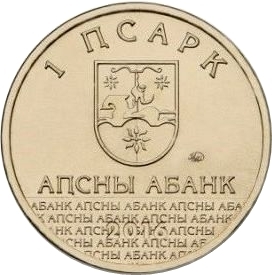 In the upper central part, on the smooth field - the relief picture of the State Emblem of the Republic of Abkhazia, under it - the inscription in Abkhaz “Аҧсны Абанк”(The Bank of Abkhazia). 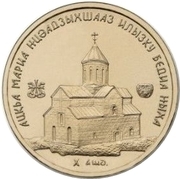 The semicircular inscriptions above the State Emblem indicate the denomination of the coin. 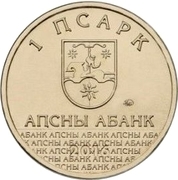 In the lower part of the coin, on the matted field and raised small print inscriptions of five lines “Аҧсны Абанк” and the year of mintage "2016". In the central part of the coin- the image of the Bedia cathedral of the Holy Mary, the Mother of God, to the left – the pictures of the Bedia vivifying cross, to the right – the Bedia gold chalice, in the upper central part of the coin- the semicircular inscription in abkhazian «Ацқьа Мариа Нцәадзыхшааз илызку Бедиа ныха» (The Bedia cathedral of the Holy Mary, the Mother of God). The inscription under the image of the Cathedral indicates the date of the building. Bedia Cathedral is a medieval Georgian Orthodox cathedral located in Bedia, in the Tkvarcheli district of Abkhazia, a disputed region on the Black Sea coast.Bedia Cathedral was originally built at the close of the 10th century and consecrated in 999 on the behest of King Bagrat II of Abkhazians, who would go on to become King of the Georgians as Bagrat III and who was interred at the church after his death. The extant edifices, however, date back to the 13th-14th centuries and include a domed cruciform church, a belltower resting upon the northern narthex and the ruins of an old palace. The southern wall of the main church contains fragments of contemporary murals, including the portraits of Bagrat II and the representatives of the Dadiani noble family of Georgia.